Rishikesh a municipal council and a tehsil in Dehradun district of the Indian state, Uttarakhand is the new destination for Adventure sports & Spirituality gains. One can enjoy river rafting, campaign, yoga and meditation camps at Rishikesh as a part of tourism in Rishikesh. Rishikesh situated on the bank of Ganga river is the famous weekend destination of nearby states like Delhi, Haryana, Uttar Pradesh and among the locals. Tourist not only from India but across the world come to Rishikesh in search of mental peace and spiritual gains. Rishikesh is a municipal council and a tehsil in Dehradun district, Uttarakhand situated on the elevation of 372 metres (1,745 feet) on the bank of Ganga River. It is the starting point for many pilgrimage yatras like Badrinath, Kedarnath, Gangotri and Yamunotri. A very famous legend associated with Rishikesh has that Lord Rama did penance here for killing Ravana and his younger brother Lakshmana crossed the river Ganges, at a point, where 'Lakshman Jhula' stands over a rope bridge that offers a splendid view of the river. One can visit the Rishikesh at any time or season as its location in the foothills gives it a pleasant weather throughout the year. However, the best months to visit Rishikesh would be February, March, August, September,October when the tourist can enjoy its pleasant weather most. Best time to visit Rishikesh for River rafting- For river rafting best time to visit Rishikesh is from late September to mid-November and from early March to the first week of May. River Rafting in Rishikesh remains closed from 1st July to Mid-September because of Monsoons season. Though one can avoid visiting Rishikesh in July because of Sawan festival when thousands of people visit Rishikesh and all major roads get blocked and hotels are overcrowded. Rishikesh is well connected by road to many major cities like Delhi (225 kms), Nainital (260kms), Shimla (262 kms), Agra (398 kms), Lucknow (555 kms) and many more cities so you can visit there by taxi, car or bus. The nearest AirPort By Rishikesh is Dehradun's Jolly Grant Airport which is approx 15 kms from Rishikesh handling many flights from Delhi only. So if you want to visit Rishikesh by air then take the flight from Delhi to Dehradun's Jolly Grant Airport then hire any road transport to reach your destination i.e Rishikesh. Rishikesh railway station is connected with Haridwar station, but there are only about three trains daily to reach Rishikesh. So It's best to take the train to Haridwar and then continue by bus, taxi or any other road transport from there to Rishikesh. White Water Rafting is very famous water sport in Rishikesh. September to November and March to May are ideal for it. One can enjoy 11 Kms, 17 Kms or even 27Kms river rafting trip in Rishikesh. One can enjoy 13 exciting river rapids throughout the rafting journey, a number of rapids and difficulties depends on the distance you choose. Camping in Rishikesh on the Ganga beach is a recreational activity especially for those who likes to explore new places and enjoy the natural beauty. One can enjoy Beach Volleyball and can take a dip in the freshwater of the river Ganges. Yoga and Meditation are the most popular activities in Rishikesh. There are many ashrams which offer numerous styles of yoga and meditation, to choose from to rejuvenate your inner soul. You can enjoy Rock climbing, Cliff Jumping, Kayaking, Bungee Jumping, Flying Fox, Waterfall Trekking, Mountain Biking and many other recreational activities at Rishikesh. Visit Triveni Ghat to experience amazing Ganga Aarti during the night is the must have experience in Rishikesh. There are many temples and places to visit in Rishikesh. 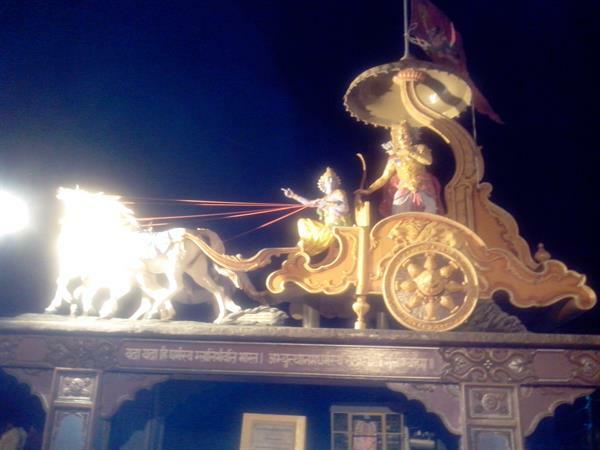 Some of the famous places to visit in Rishikesh are as follows. Ram Jhula situated 3 Km in the north of Rishikesh is a suspension bridge made over river Ganges to cross the river is a very popular landmark of Rishikesh. It is recently constructed between Sivananda Ashram and Swarg Ashram. 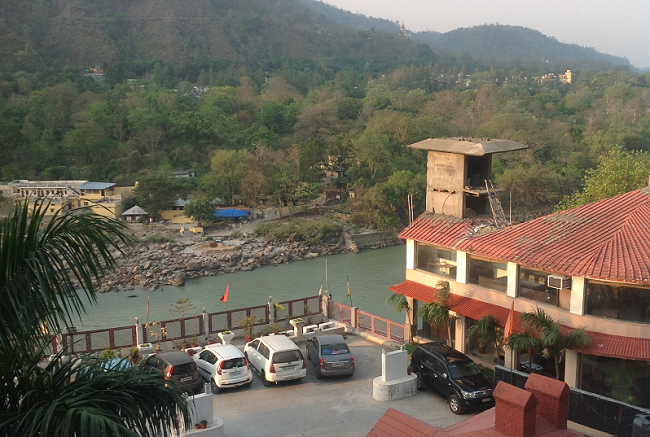 One can feel the fresh air and enjoy the scenic beauty of Rishikesh from Ram Jhula. Lakshman Jhula 450 feet long suspension bridge is one of the most famous landmarks of Rishikesh. It is said that Lakshman crossed the Ganges on jute ropes between the place where this bridge is built. It shakes little when you cross it and offer spectacular views of the river. Triveni Ghat situated on the banks of Ganges River is a most sacred bathing spot in Rishikesh. Triveni Ghat is a confluence of three sacred rivers that are Ganga, Yamuna and Saraswati. Ganga Aarti daily in the morning and evening is the most peaceful activity once can feel at Triveni Ghat or just sit on the banks of the river and enjoy the cool breeze from the river. Neelkanth Mahadev Temple is at a distance of 12 km from Rishikesh. If you visit Rishikesh than it's always recommended to visit this amazing temple dedicating to lord Shiva. It is situated at a height of around 1675 meters. It is said that Shiva consumed the poison oozed during 'Samudra Manthan' at the place which is now known as the Nilkanth Mahadeo. There are many other places to visit in Rishikesh like Vashista Gufa, Swarg Ashram, Gita Bhavan, Parmarth Niketan, Bharat Mandir, Neer Garh Waterfall and local markets. Rishikesh offers many luxuries and pocket-friendly accommodation for the tourists. But the best accommodation is at camps near the bank of Ganga where one can enjoy beach sports and swim in the freshwater of the river Ganges. One can also stay in Ashrams in Rishikesh to get yoga and meditation lessons some of the famous Ashrams in Rishikesh are Osho GangaDham ashram, Anand Prakash Ashram, Yoga Niketan and Swargashram. You can enjoy delicious vegetarian food in Rishikesh as it has many small and big eating joints there. A spiritual, adventurous, cost -effective pilgrimage in the lap of the foothills of the Himalayas in Uttarakhand This place is not crowded yet the infrastructure and the human resources are developed.So one can have both Bhakti (Ashrams, Ganga) and Shakti (sports) without much hustle-bustle yet absorbing every bit of Nature and getting the feeling of a Nurturer.The Ganga Aarti, yoga, meditation in front of the ghat is mesmerising and unique. Staying in Rishikesh is like having variety in a platter.Gita Bhawan, Paramarth Niketan, Swargashramand and many other are Ashrams where Bhajan, Kirten, Pravachan and chanting fill our heart, mind and soul with Bliss and Blessings.Even an atheist can feel the presence of The Omnipotent in every bit of the auspicious Rishikesh. Guest house, Lodges, Three-star.Five-star hotels are also there but bookings need to be done a week before and it depends on the season of tourism in Rishikesh. It's advisable to purchase spices, shawls, drink sugarcane juice, eat Ram-phal, cucumber and once have breakfast at Geeta Bhawan's sweet shop, At Geeta Bhawan's Ghat special arrangements are made for women to take bath and change at ease.Morning Ganga Aarti could be performed in any of the Ghats.It brings good fortune at the same time feeling of oneness and belongingness with nature.Human integrity and Intel get metamorphosed as well as harmonised into Great and Pious Souls in the Land of Rishi's Hair i e., Rishikesh. I have been to Flying Fox Rishikesh especially to do zip line adventure over the river Ganges at an height of 70m. So, Rishikesh is also getting commercialized like many pilgrimage centres. This is so sad to know. I hope authorities restrict this so as to protect the fragile environment in Rishikesh. Already pollution and rubbish spread all through the river and the town is overwhelming for a new visitor. By the way, adventure tourism sure has a good scope in this place. Care to tell what are the important adventure zones or parks in Rishikesh?